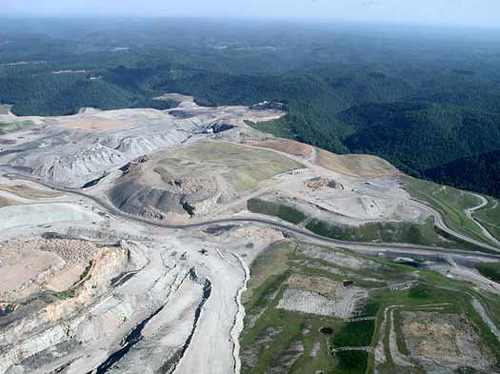 August 18, 2016 by Ken Ward Jr.
As the National Academy of Sciences begins to gear up for its review of the health impacts of mountaintop removal coal mining, the scientist who really brought this issue to light has a new study out that’s worth checking out. The 1990 amendments to the US Clean Air Act (CAA) encouraged the growth of mountaintop removal (MTR) coal mining in Central Appalachia. This study tests the hypothesis that the amendments had unintended impacts on increasing mortality rates for populations living in these mining areas. We used a panel design to examine adjusted mortality rates for three groups (all-cause, respiratory cancer, and non-cancer respiratory disease) between 1968 and 2014 in 404 counties stratified by MTR and Appalachian/non-Appalachian status. The results showed significant interactions between MTR status and post-CAA period for all three mortality groups. These differences persisted after control for time, age, smoking rates, poverty, obesity, and physician supply. The MTR region in the post-CAA years experienced an excess of approximately 1200 adjusted deaths per year. Although the CAA has benefits, energy policies have in general focused on the combustion portion of the fossil fuel cycle. Other components of fossil fuel production (e.g. extraction, transport, and processing) should be considered in the comprehensive development of sustainable energy policy. The Clean Air Act has been a huge success, dramatically decreasing emissions and improving ambient air quality. According to EPA (https://www.epa.gov/air-trends/air-quality-national-summary), since 1980 NOx is down 60%, SO2 is down 84%, Lead is down 99%, etc., while fossil generation has increased. They don’t include data on CO2 here, but CO2 obviously isn’t causing respiratory disease. We can’t see his paper without buying it, but it would be interesting to know what exactly these “unintended consequences” are, that are supposedly adversely affecting health in mining communities. It may also be telling to understand who is sponsoring his work. Could it be possible that they have another agenda? Hopefully, the National Academy of Sciences review will help clarify the facts. creekviewcamp, Dr. Hendryx’s work is not sponsored by anyone. Well, except maybe the university he works at. There is no agenda. The abstract to the study is quite clear and he worked with dust off of mountaintop removal sites which frequently gets blown down in communities. There is nothing about CO2. Delinquent dust, especially that from a blown up mountain, is also covered by the CAA. And I wonder, have you tried looking for the published article in periodicals at the library?